Memory advisors – how reliable? I like the memory advisors that are available from the OEM GUI or the direct database tables themselves. If I want a quick overview of whether a memory area (shared_pool, cache or the overall memory target itself) needs reviewing look there first. Note that I did not include PGA here specifically, I am well aware that PGA is included with the MAX_MEMORY_TARGET value – I am not considering that view in my discussion here because it is so subjective to the application and what the users are doing and the code being run. The graph tell us that we have a MAX_MEMORY_TARGET of 4Gb and increasing it will not improve database time (the blue line continues on the same horizontal tangent right through to 8Gb). This database runs our production Help Desk application and is busy, with a lot of searches for incident, problems and change management records so it would seem logical to me that more memory might improve performance. Not guaranteed but worthy of investigation. Given what we have seen so far it must be a no-brainer that any overall increase above a combined total of 4Gb for SGA and cache will not make any difference. Interesting – if we increase SGA to 5Gb then we would see 54% less disk reads – in theory at least. It is reasonable to assume that the shared pool does not need increasing but we had better check that first. 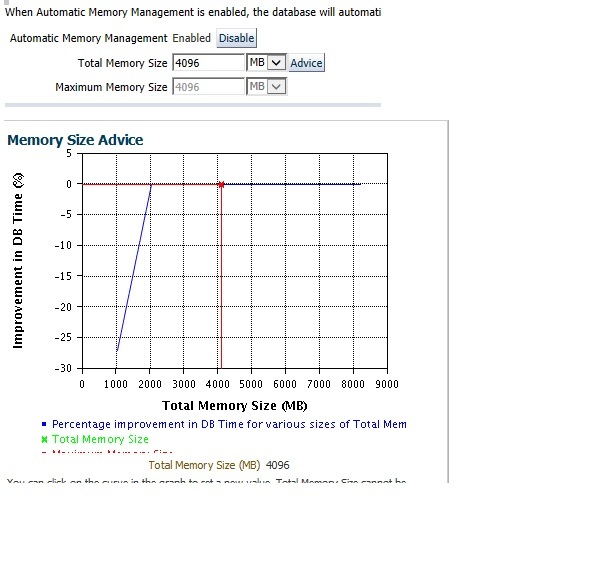 So now we have clear evidence that increasing memory and in particular the size of the cache would reduce I/O by a very significant level, yet on first viewing of the memory target advisor that was not the case. I cannot move forward with this just at the moment because I need to see if we can get more memory added to the server but it is certainly something to work on in the next couple of weeks. Obviously I would need to do more research before changing production values but I have sufficient evidence to think it might be a worthwhile exercise. This entry was posted on December 24, 2015 at 8:47 am	and is filed under Oracle. Tagged: amm, automatic memory management, max_memory_target, memory advisors, memory management, v$db_cache_advice, v$sga_resize_ops, v$sga_target_advice, v$shared_pool_advice. You can follow any responses to this entry through the RSS 2.0 feed. You can leave a response, or trackback from your own site. both for the v$ views and the DBA_HIST views. Something I’ve had in the back of my mind for some time now. What do you think, does that sound useful? Thanks for the feedback Jared. I think it sounds very useful and I was thinking along those lines myself – it is really a matter of determining what the optimum point is – a colleague has something which I think he will post here soon which is a starting point. The script must offer advice only and options and not be too prescriptive. ,round( 1-( sga.ESTD_PHYSICAL_READS / A.ESTD_PHYSICAL_READS ) ,4 ) * 100 as "% Improv"
,round( ( ratio_to_report(sga.ESTD_PHYSICAL_READS ) over () ),4 ) * 100 as "Cost Eff Ratio"